This isn't your grandpa's drive-in movie experience! How many times have you been in a movie theater and wished you could just lay down with a cozy pillow and blanket? While many theaters now have recliners, they just don't seem to quite meet the snuggle-up-and-relax needs that we all have deep within us. Enter The Bed Cinema. Yes, your movie-watching desires are about to come true thanks to a blissful and unique experience. "We all love movies in bed. Now here's another reason to stay in bed with the world's largest "bed cinema," which is coming to cities across the U.S. this summer," says TheBedCinema.com. This summer, starting in August, you will watch movies under the open sky the way they should be watched with The Bed Cinema. The company will offer outdoor films, complete with over 150 double beds with pillows, blankets and an LED-lit bedside table for your viewing enjoyment. For the germaphobes out there, there is no word on how they are sanitizing all these things between showings, but maybe just bring a vat of Purell. This could be you! Courtesy of The Bed Cinema. Bring a friend or two with you, as each bed holds up to three people, or you can avoid the bed altogether, if you prefer. 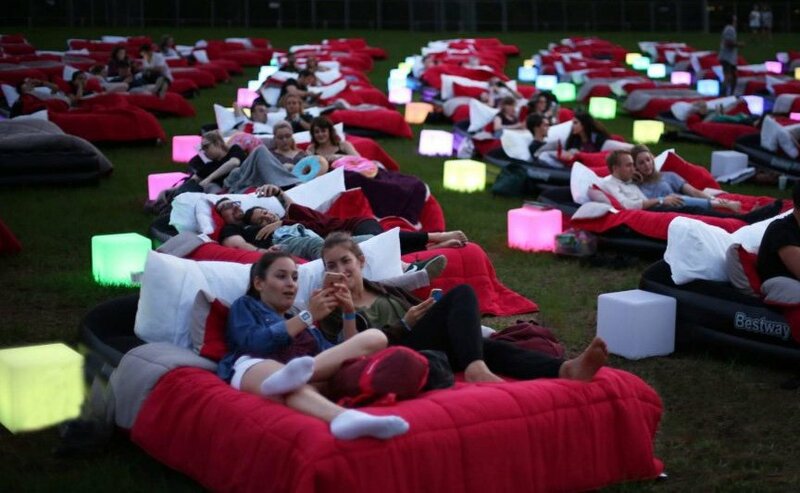 "Guests can also bring their own picnic blankets if lying in bed isn’t their preferred movie-viewing position," says the website. The Bed Cinema is a roaming pop-up theater experience that will be setting up in locations across the country late this summer. The company promises that it will screen a number of blockbusters during its run. And, being hosted in August, you can enjoy wonderful, warm, late-summer evenings while catching a flick. So far, the locations haven't officially been released, though we do know it's coming to the Mile High City. But you can sign up for pre-release tickets at TheBedCinema.com. Are you excited to snuggle in bed and watch a movie? Let us know in the comments.